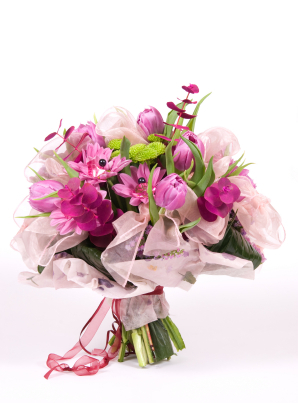 Creating your own bouquets or flower arrangements can be challenging yet exciting. Fiftyflowers.com has an extensive variety of beautiful bright flowers available for you to pick from and your guests will surely notice the vibrant colors in your bouquets or arrangements. Take a look at some of our beautiful summer flowers such as Peruvian Lilies, Orange Freesia Flower, Spider Mum Yellow Flower, Hot Pink Dahlia Flower, or Organic Bright Sorbet Rose Petals. When using larger flowers consider using the following stem amounts to create the following bouquet sizes. Small 10-15, Medium 15-25, and Large 25-30 stems. When using smaller flowers consider using the following stem amounts to create the following sizes. Small 12-15, Medium 15-20, and Large 20-30 stems. A bridesmaid’s bouquet will typically be half the size of the bride’s bouquet. Of course, keep in mind that the total bouquet size will grow if you incorporate fillers and greens. Order your flowers online today at Fiftyflowers.com and remember we are always here to give you suggestions or answer your calls.